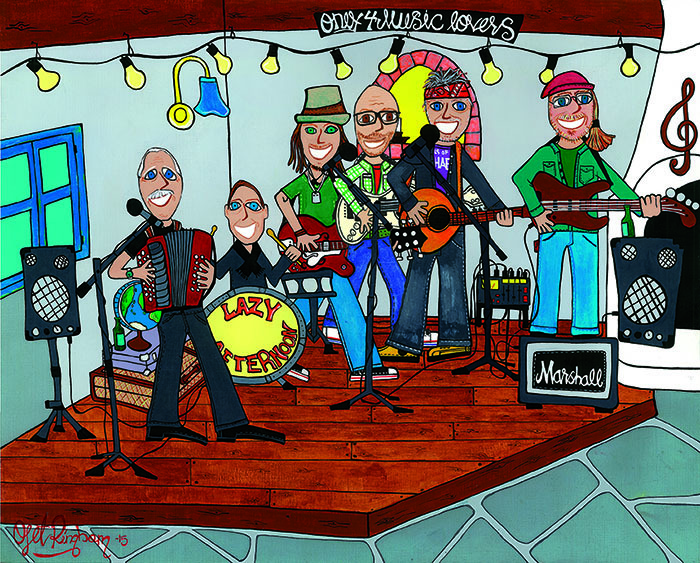 Swedish band Lazy Afternoon combines genuine songwriting with a personal tex mex sound. Their debut album “Whatever!” is nothing more than 47 minutes of pure delight for those who like groovy americana. “Our sound comes from many years of experience as live musicians and the love of various genres”, says band leader Bo Ahlbertz. “We have picked the feeling and the stories from country, the groove from tex mex and a little attitude from rock’n’roll”. The infectious groove is highly created by Jörgen Ahlqvist’s accordion, although the instrumentation is not classic tex mex. Lazy Afternoon has invented their own musical flavouring including stylish country licks and influences from folk music. As a member of the folkrock group Patrask, Bo Ahlbertz learned to play Irish bouzouki, an instrument that on songs like “Shelter Me” and “Farewell” contributes to Lazy Afternoon’s special version of americana. The songs of “Whatever!” are made during a period when Bo Ahlbertz has developed his songwriting craft, not least through the international songwriting camps he´s been attending since 2004. The storytelling tradition has inspired the album, where each song reveales a story, about grief, love, nature or a a desire to start over in life. “Even if we make catchy dance music, you could find a deeper dimension in the lyrics”, concludes Bo Ahlbertz. They deal with life experiences that many people can identify with. Most of the songs on ”Whatever!” are co-writes with, among others, California-based Burton Jespersen and his acclaimed colleague Sofia Ekberg Ekberg (My Quiet Companion). Bo Ahlbertz contributes four original songs (“Goodbye”, “Past Away”, “Going South” and “Afternoon”), and drummer Mattias Svensson the delicate “Shelter Me”. Founder and songwriter Bo Ahlbertz is a well known profile in the musical community on the Swedish island of Gotland. During the 80’s and 90’s he was a touring musician in Westerness and Patrask (bands inspired by Scottish and Irish folk music). After that he began writing songs within the americana tradition leading up to his solo debut in 2013 and the forming of the band Lazy Afternoon. Since then, the repertoire has expanded with 13 new songs. “Whatever!” is recorded by Anders Nordh in Studio Måsen on the island of Gotland, produced by Bo Ahlbertz and released by Artache. This entry was posted in Releases by Lazy Afternoon. Bookmark the permalink.